Looking for a last minute, easy side to serve on your Easter table? My sister-in-law makes these for many of our holiday gatherings and they are easily a family favorite! We have The Barefoot Contessa, Ina Garden to thank for this perfect recipe. ps - fresh dill makes an extra yummy addition to this recipe! Bring a large pot of salted water to a boil. Add the green beans and blanch them for 2 to 3 minutes, until tender but still crisp. 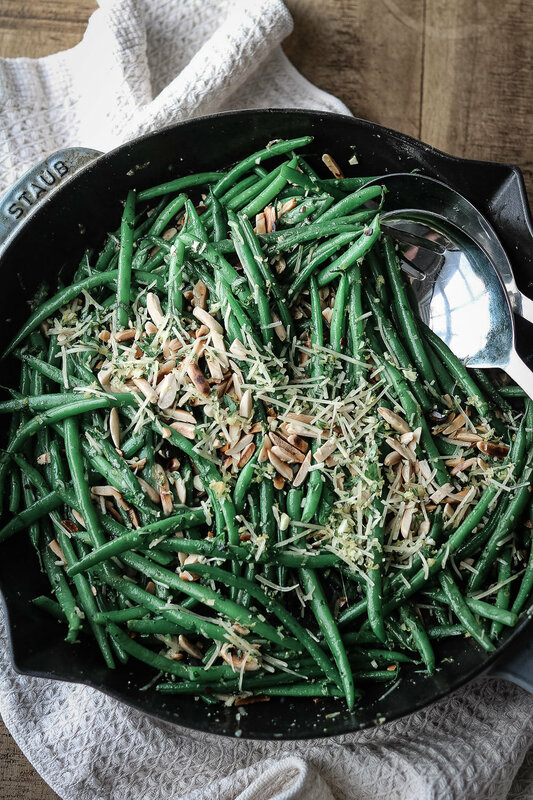 Drain the beans in a colander and immediately put them into a bowl of ice water to stop the cooking and preserve their bright green color. For the gremolata, toss the garlic, lemon zest, parsley, Parmesan and pine nuts in a small bowl and set aside. When ready to serve, heat the olive oil in a large saute pan over medium-high heat. Drain the beans and pat them dry. Add the beans to the pan and saute, turning frequently, for 2 minutes, until coated with olive oil and heated through. Off the heat, add the gremolata and toss well. Sprinkle with 3/4 teaspoon salt and 1/4 teaspoon pepper and serve hot. Holiday decorating can easily put a dent in your pocketbook. Each year brings new trends and new ideas. For my front porch, I love putting a wreath on either side of the door and premade wreaths can easily cost $200+ for a duo, crazy! This is why I love grapevine wreaths, they come in under $30 each and can be used over and over for every season/holiday! 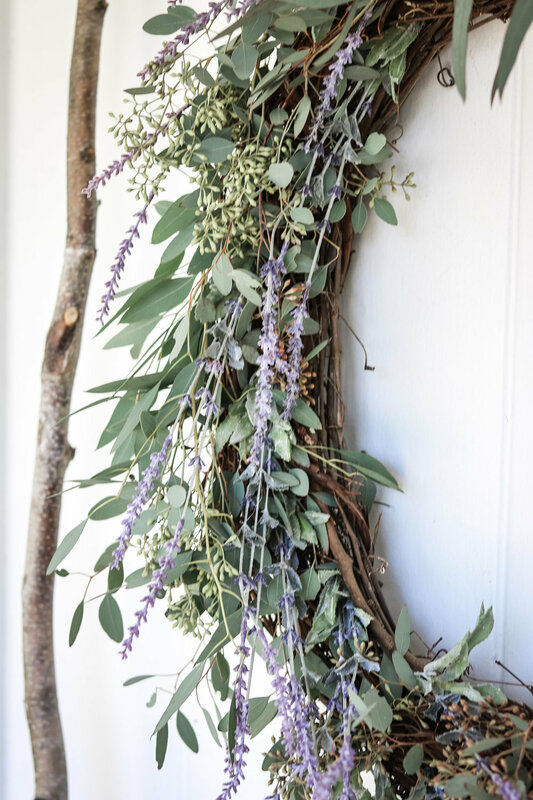 Spring this year, I used some fresh eucalyptus from Trader Joes and some faux lavender sprigs from Hobby Lobby, available here. They turned out BEAUTIFUL! This cake is a flavor show stopper. One that will leave your dinner guests swooning. This recipe takes a bit of time, but it is worth every minute. Preheat oven to 350 degrees. Line the bottom of three 9-inch cake pans with parchment paper. Lightly grease and flour the pans , tapping out the excess. For the cake batter: In a large bowl, beat the shortening, butter, sugar blending until fluffy. Scrape sides and bottom of bowl. Add egg yolks one at a time, mixing well after each addition. In a separate large bowl, sift together the flour, baking powder, and salt. Set aside. In a medium bowl, combine the milk, buttermilk, cream, and vanilla. In three additions, add the flour mixture alternatively with milk mixture the creamed sugar mixture. Begin with the flour and end with the flour, scraping bottom and sides of bowl after each addition. Blend evenly, but do not overmix. Using a whisk or hand mixer, beat the egg white until they hold a peak. Using a rubber spatula gently fold the whipped egg whites into the cake batter. Carefully fold in chopped strawberries. Divide the cake batter evenly between the prepared cake pans. Gently tap pans on counter to level out batter. Bake 22-26 minutes, or until cake tester into the center comes out clean. The top of the cake should be a golden color. Cool cake in the pans on wire rack for 15-20 minutes, then transfer the cake to wire rack and allow to finish cooling completely. Dissolve 1 cup of sugar in 1 cup of hot water to create a simple syrup. Brush the cake layers with the simple syrup while on the wire racks. This is what makes the cake so moist, so yes, use it all. When cake layers are cool, if not frosting immediately, wrap layers with plastic wrap tightly and place in fridge. When ready to frost, prepare the buttercream. For the Buttercream: In a large mixing bowl, combine the butter, cream cheese. Add the powdered sugar in increments, scraping the bottom and sides of bowl. Add vanilla. Mix well. Gently fold in strawberries that had been draining on paper towels. Place in fridge 20-30 minutes before frosting the cake to firm, careful not the leave too long or it will become too hard. Place the first layer on a cake plate and spread with thin layer of buttercream. Repeat with remaining layers and front entire cake! Keep cake refrigerated until ready to serve. Enjoy! It ‘s officially “frost-free” date (April 15) in Nashville so it’s safe to get those summer veggies in the ground & started for summer! Tonight we are having an impromptu garden planting dinner party before we head out of town for Easter. It’s fun to get your hands in the soil, especially with friends & kiddos. We started lots of seedlings this year, but you can always head to your local nursery or home improvement store to get some plants! PS - there are a FEW tickets left for my April 28th dinner party! Click here for tickets! This salad celebrates the very first vegetables of Spring. Asparagus (my personal favorite), radishes, and tender baby lettuce. Ready in minutes this salad is a lovely recipe to add to your recipe box. Prepare a large pot of boiling water and a large bowl of ice water. Drop the asparagus into the boiling water and blanch for 45 seconds. With a slotted spoon remove the asparagus and immediately immerse in the ice water to stop the cooking process. Keep in the ice water long enough to cool completely. Next drop the edamame into the boiling water for 2 minutes. With a slotted spoon remove the edamame and immediately immerse in the ice water to stop the cooking process. Keep in the ice water long enough to cool completely. In a jar shake together the olive oil, lemon juice, garlic, and a pinch of salt and pepper. Assemble a salad in a large bowl. 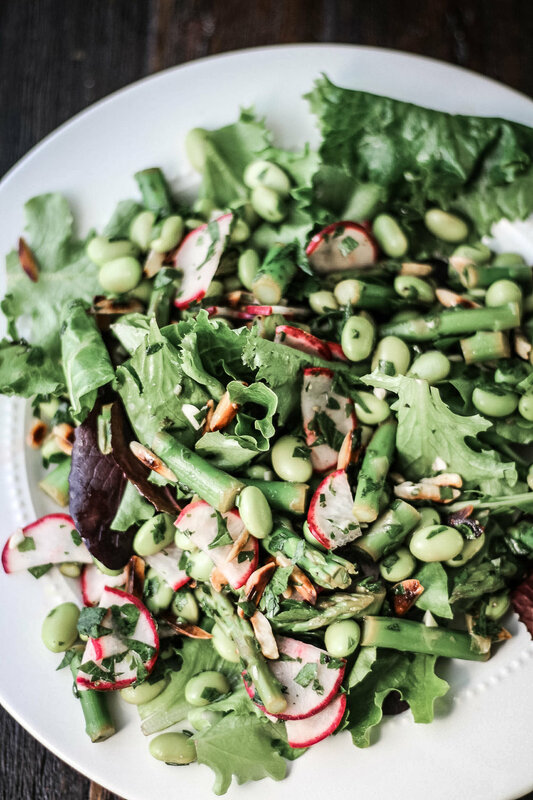 Combine the asparagus, edamame, parsley, mint, radishes and salad greens. Toss the salad with the dressing and slivered almonds. Season with salt, pepper, and more lemon juice to taste.